EA Sports is well known for licensing partnerships, especially exclusive ones that command quite a premium from the publisher. Yet in one of its timelier, and more unusual ones, no money changed hands. The label, through its FIFA franchise, of course, is the official games partner of Manchester City, recently crowned champion of the English Premier League in one of the wildest finishes in any sport, anywhere, ever. While there is a benefit to both sides in teaming up—EA gets a promotional association for free, and City has access to EA Sports content and even telemetry (more on that later), the arrangement should benefit fans by giving them additional means to be closer to their favorite football club, said Matt Bilbey, the executive in charge of FIFA at EA Sports. "What they [Manchester City] quickly understood is, for 90 minutes on a Sunday, fans of Manchester City are emotionally connected to that team," Bilbey told me at E3. "Outside of that 90 minutes, the emotional connection is through our game. They go online to be a representative part of that team on a daily basis." The two sides came together last summer, when City visited Vancouver, the home of the EA Sports studio that makes FIFA to play a friendly with the MLS' Whitecaps club. While EA Sports has had relationships with 20 other clubs worldwide—including high-profile sides like Arsenal and Real Madrid—money was involved in the arrangements. In this case, City didn't ask for anything to team up. "They are fortunate that they dont have to earn money because they are owned by the richest man in the world," Bilbey said. Still, "It was City that came in with a unique and new view of pushing boundaries." For example, the club debuted an alternate kit this season—a red-and-black shirt that is quite a departure from the traditional blue color. [Correction: A Manchester City fan wrote this Yank to point out that red-and-black kits were worn in 1968—incidentally, the last year, before this one, when City won a Premier League title. Red-and-black alternates were also featured in 2005-2006 and 2008-2009.] 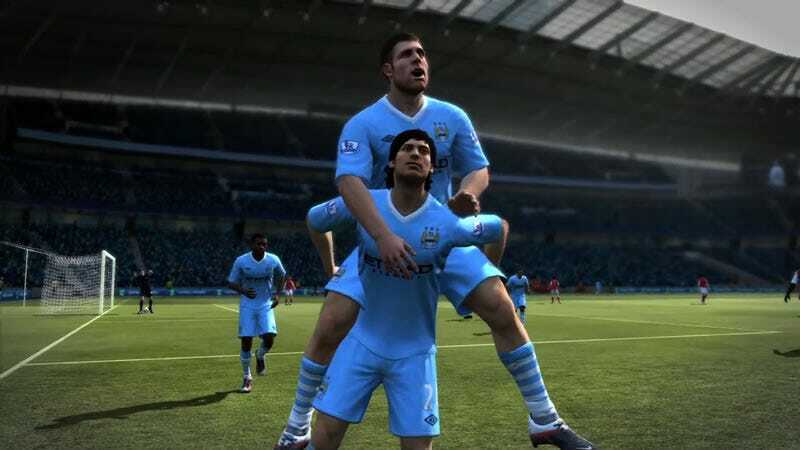 While City itself designed the latest look, EA Sports provided the first "footage" of it in action, giving fans scenes of City players scoring goals against rival sides, instead of a simple modeling shot at a news conference. you can see in that video at left. Fans responded enthusiastically. FIFA's team, which shares data with City on three- and six-month intervals, reported that the alternate kit is the most-used look when City players use the team. "Most of their audience are youth who play games, so they were like, 'This is really cool,'" Bilbey said. "They connected with it. The partnership has really done something, and now a lot of clubs are looking to us." What EA Sports gets is access to the team, its players, and Ethiad Stadium, in ways that can either promote the game or potentially add content to it—though Bilbey was quick to say there won't be any special in-game features, such as interviews or cinematics—for FIFA 13. But it sounds as though this relationship, and others that have yet to be announced, could create that sort of thing in FIFA 14 and future editions. It may seem trivial, but there is value in a football club knowing how many fans they have, where they live, what uniforms excite them—these are preferences sports marketers would pay a lot for in surveys that many are unlikely to answer or complete. Yet any time a Manchester City fan—or Arsenal, or United, or Tottenham—turn on their console or PC, they answer all of these questions completely. "We joke about this with some teams, when you've got that many people playing an online game, as Manchester City, from the crowdsourcing data, we probably could have predicted the final result, or advised [manager Roberto] Mancini, and given him the best formation he could have used, based on the half-a-million games played the morning of that fixture," Bilbey mused. Is that part of the arrangement? Is FIFA really supplying performance analysis to inform on-field decisions? "No, no," Bilbey said, laughing. "I don't think Roberto Mancini would take his guidance from a video game.